Reaching out to people at the Alzheimer Society of Calgary saved my life. They really understood, and didn’t judge me." 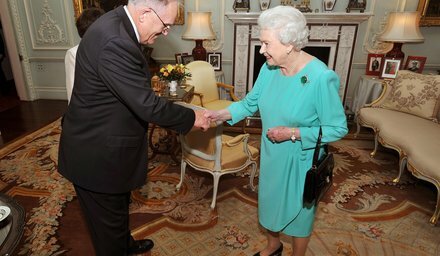 Don meeting Queen Elizabeth II at Buckingham Palace in London, England. 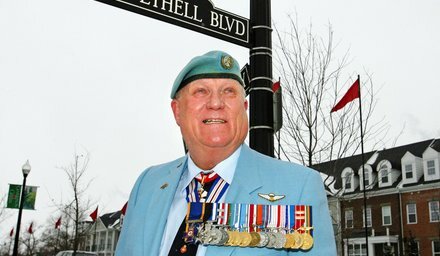 We recently had the pleasure of speaking with His Honour Colonel (retired) Donald Ethell, Order of Canada. Don is one of our nation’s most decorated peacekeepers, the former Lieutenant-Governor of Alberta and a past board member of the Alzheimer Society of Calgary. He stopped by to share his continuing passion for improving the health and wellbeing of veterans. “Alzheimer’s disease is a cause that’s always been near and dear to me and my son is an Alzheimer’s disease researcher in California. "We’re lucky not to have any cases of dementia in our family, but I’ve known many servicemen and women who have been impacted by this terrible disease. It’s definitely a growing area of concern for many of my friends,” he says. A recent study from the University of California has linked traumatic brain injuries in veterans with a 60% increase in the likelihood of developing Alzheimer’s disease or a related form of dementia(1). Another study found that veterans who experience post-traumatic stress disorder (PTSD) are twice as likely as those without PTSD to develop dementia(2). Don with the street that bears his name in the Calgary community of Garrison Green. “No one wants to talk about these issues, or that they’re having trouble coping. Don is a proud member of the Calgary chapter of CAVUNP (Canadian Association of Veterans in United Nations Peacekeeping). 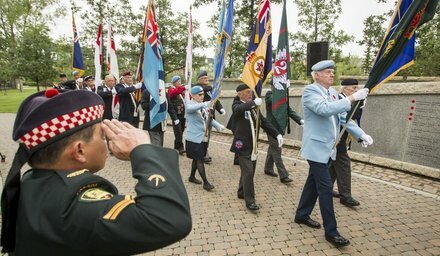 Their distinctive blue peackeeper's berets can be seen in this photo from International Peacekeepers Day at Peacekeepers Park in Garrison Green. Your support of the Alzheimer Society of Calgary helps provide veterans and their families with a free, confidential and expert source of help in their time of real need. You also create immediate, tangible and 100% local impact for a growing number of families in Calgary and area, above and beyond those who have proudly served our country. To learn more about reversible and non-reversible risk factors for Alzheimer's disease and related types of dementia, click here. (1). Barnes, D.B. et al. (2014). Traumatic brain injury and risk of dementia in older veterans. (2). Yaffe, K. et al. (2010). Post-traumatic stress disorder and risk of dementia among U.S. veterans.